In terms of connectivity, the Samsung Galaxy Ace 3 starts off with the basics - quad-band GSM/GPRS/EDGE and tri-band 3G. An LTE-variant of the device is also available, with coverage for LTE 800 / 900 / 1800 / 2600 bands. The Ace 3 uses Bluetooth 4.0 alongside Wi-Fi support which includes b/g/n with both 2.4GHz and 5GHz band compatibility. The LTE-enabled Galaxy Ace 3 allows you to share all sorts of media via NFC by simply touching the S4 and other later-generation S devices back-to-back. You can share with other NFC devices as well, but functionality is limited to what is provided by the stock Android Beam. The Samsung Galaxy Ace 3 comes with two excellent web browsers - the stock Jelly Bean edition and Google Chrome. The stock browser UI is quite minimalistic - you get the URL bar with shortcuts to tabs and settings, and that's that. Hitting the Settings key reveals the rest of the controls - everything from searching on the page, saving to bookmarks to useful options like bypassing mobile sites, saving a page for offline reading and sharing a page. The Web browser comes with Incognito mode, which lets you surf the web without the browser keeping track of your history or storing cookies. The brightness and colors option gives you four different presets to adjust the display according to your preferences. Automatic brightness is an option too, and works only within the browser. Unfortunately, there is no Lab settings and you can't enable the Quick Controls we've seen on other droids. If you prefer, you can use the other preinstalled browser, Chrome, instead. It offers excellent cross-platform sync capabilities, and at times it performs even faster. While it doesn't have all of the extra apps Samsung throws into their flagships, the Samsung Galaxy Ace 3 does have a few nifty applications that help it stand out from other smartphones. S Translator will help travelers - it can translate between two languages using either typed text or speech recognition. It can read out the resulting translation too, if you don't think your, say Korean accent can cut it. S Translator supports many widely-spoken languages - English, Chinese, Spanish, Portuguese, French, German, Italian, Japanese and, of course, Korean. Finally, the Galaxy Ace 3 comes preloaded with a special "Samsung edition" of the TripAdvisor app. Besides the ability to supply a fresh supply of lockscreen background images, the Samsung-specific version of the app allows you to login with your Samsung account, use the S Travel widget for a quick peek at certain popular travel destinations, as well as automatically add relevant travel information to your photos. 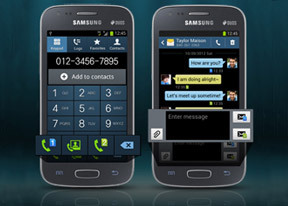 The Galaxy Ace 3 gives you only the Polaris Office viewer functionality, instead of the full-fledged editor. The viewer does not show up in your app drawer, but instead only opens when you select the relevant document from the My Files app. Nevertheless, you can view most document types, including PowerPoint, Word, Excel as well as PDF. It can present the document as is or reflow the text to fit on the screen.